During these last months of Summer, Luis Buitrago called me each time he came to tend the gardens of Spitalfields. With the gracious permission of the owners, I was able to visit these hidden enclaves of green that are entirely concealed from the street by the houses in front and the tall walls that enclose them. If you did not know of the existence of these gardens, you might think Spitalfields was an entirely urban place with barely a leaf in sight, but in fact every terrace conceals a string of verdant little gardens and yards filled with plants and trees that defy the dusty streets beyond. 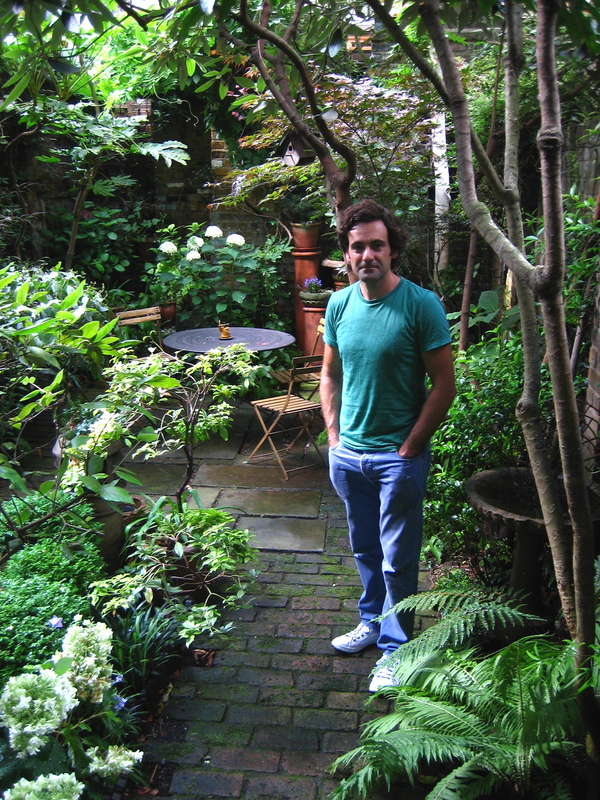 Luis Buitrago is a gardener and landscape architect who came to Spitalfields ten years ago and lived here for four years while working on the renovation of 7 Fournier St, where he created his first garden which you can see above. In subsequent years, as the news of the charming Luis’ unique talent to conjure horticultural magic has spread, he has become the preeminent gardener in Spitalfields, designing and maintaining the gardens of many of the resident luminaries that discretion prevents me from naming. It makes for a very satisfactory arrangement, because Luis has become uniquely experienced in the special challenges posed by these shady humid locations and when he comes over to do the weeding and watering, he can simply run up and down the street going in and out of all the doors, moving from one garden to the next. The incarnation of modesty, Luis did not reveal that he has a degree in classics from the University of La Mancha, instead he simply explained that he found himself teaching at a school in South London and had an itch for something more. His three passions were languages, architecture and gardens and so he chose to study landscape architecture at the University of Greenwich. “In Spitalfields the gardens are quite particular, they are micro-climates that are very shady and very sheltered.” explained Luis, in the gentle tone that is his characteristic mode of speech. 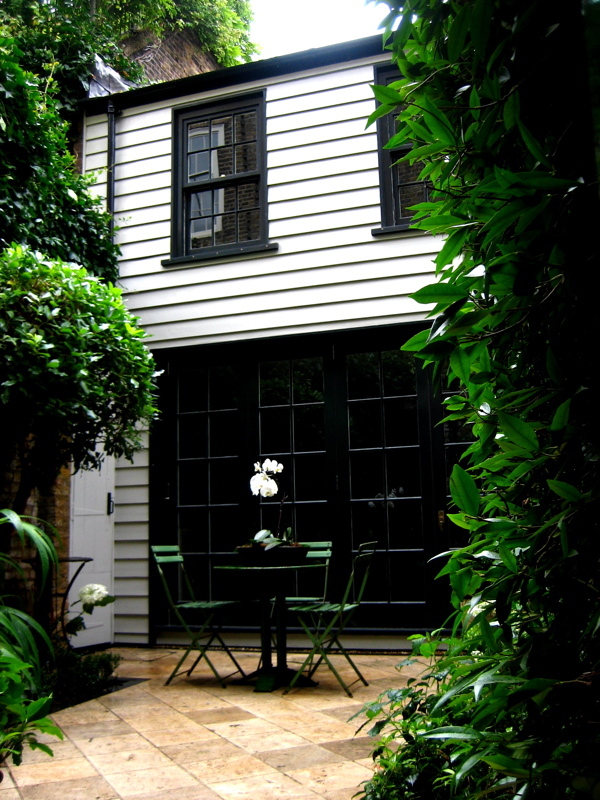 “My approach to number 7 Fournier St, which is quite a small garden, was to create the feeling of a hidden woodland glade. I used large ferns to create the shade and planted birch and, over the years I have worked on it, I have added pieces of architectural salvage I have picked up.” I visited this garden one hot July afternoon when Luis had just watered it and I was astounded to walk from the street through the house and be transported into the cool of the garden where shafts of sunlight penetrated the green shade and every leaf glistened. The most mature of Luis’ Spitalfields gardens, this has a such diversity and detail that I could happily have passed my afternoon in this peaceful retreat. Over in Princelet St, I discovered a much larger more formal garden with a playful cat that insisted on being photographed. “The nice thing about this garden is that you think it’s finished when you get to the end of the path but then there’s more.” said Luis, as he led me down the path with the cat following along behind us.“The tall walls make it mysterious and the owner has placed pieces of statuary to be discovered that give it a magical atmosphere. But in such humid conditions you have to be very careful with planting and you tend to go for texture rather than flowers.” he added. There was no sound of the city to be heard, birdsong filled the air and I loved all the deep contrasted foliage of this extraordinary lyrical garden full of shadow and drama. 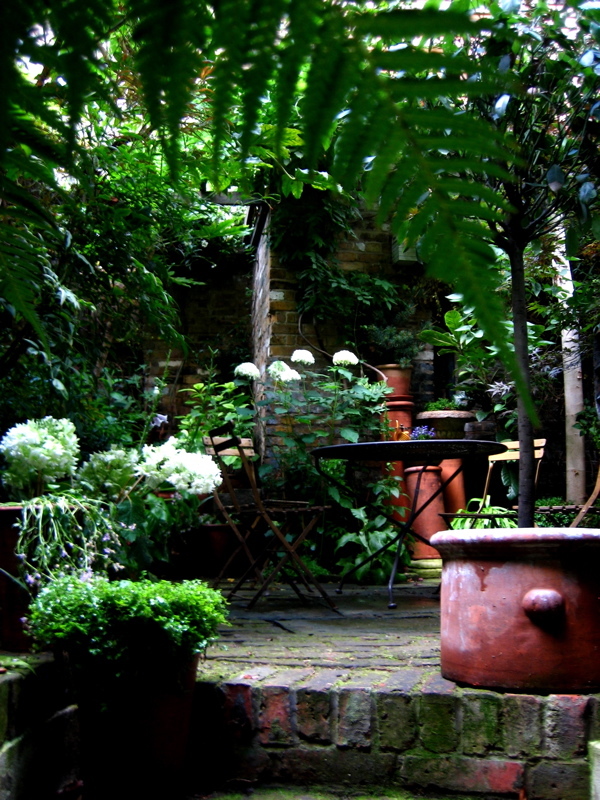 Back in Fournier St, Luis showed me a shady courtyard between the house and a guesthouse. “There is a symmetry of structure here but the planting is asymmetric,” he informed me as I inhaled the heavy scent of Jasmine that lined the walls, “On this side I planted Hydrangea and on this side is a Strawberry Tree. 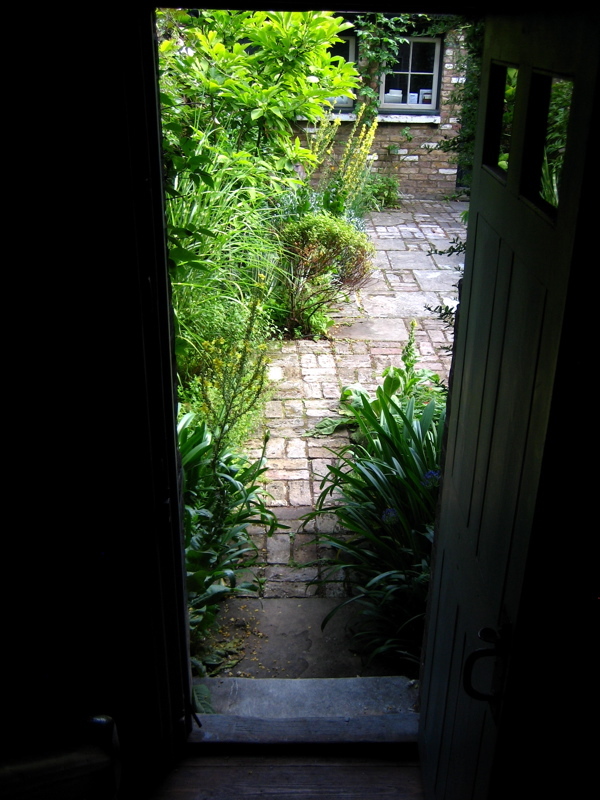 The garden is simple but very effective because it is enclosed like a box.” Again, I wondered at this secret space that, paved with shining marble and sheltered from the blinding sunlight, could be anywhere in Italy or Spain. Down in Walden St, we walked through a terrace of nineteenth century cottages to discover a garden exposed to the sun, “This is just four years old, quite a hot garden, and the owner wanted it to feel bright and enjoy the sunshine, so big structures were out.” revealed Luis, gesturing at the blue sky,” I had to choose plants that thrive in dry sunny conditions, sheltered all around by walls, so I was able to grow Echiums that are quite tender and Verbascum have been successful here. They have seeded themselves and there have been more each year.” Let me admit, I especially enjoyed the modest informality of this garden, sitting upon the oak bench here I could easily imagine I was in the Cotswolds rather than Whitechapel. Each of the four was distinctive, yet all of Luis Buitrago’s gardens share his self-effacing charm – in the sense that they are not demonstrative, lacking in ostentatious conceptions, instead by complementing the environment and the architecture they offer relaxing spaces to seek solace. These are landscape designs that are responses to the architectural space, which have evolved through canny choices of plants that suit the respective locations. I admire Luis’ sense of poetry and romance in gardens, balanced by his practical delight in the act of gardening. I love the way that each of his gardens is like a magic box, playing upon the surrealism of their urban location, and exploiting their high walls to construct alternative worlds that are outside time. The owner of this garden has placed pieces of statuary among the plants for the visitor to discover. In this courtyard in Fournier St the walls are covered with a curtain of Jasmine, giving a intense fragrance that is strongest at night and lingers all Summer long. Luis Buitrago with the smallest garden in Spitalfields, that he contrived in two granite troughs in Fournier St. 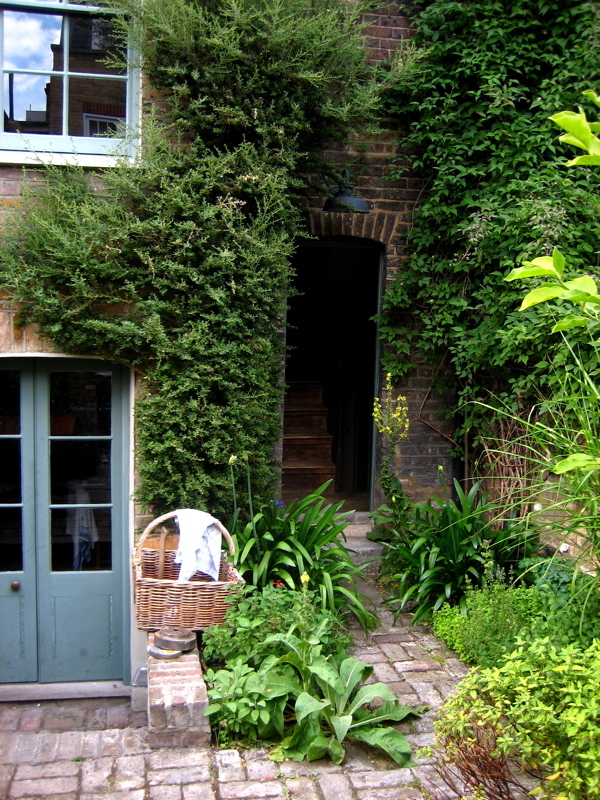 This is a fantastic entry, courtyard gardens hide such secrets behind walls, and so rarely seen. Stunning, such lush beauty you can smell it. 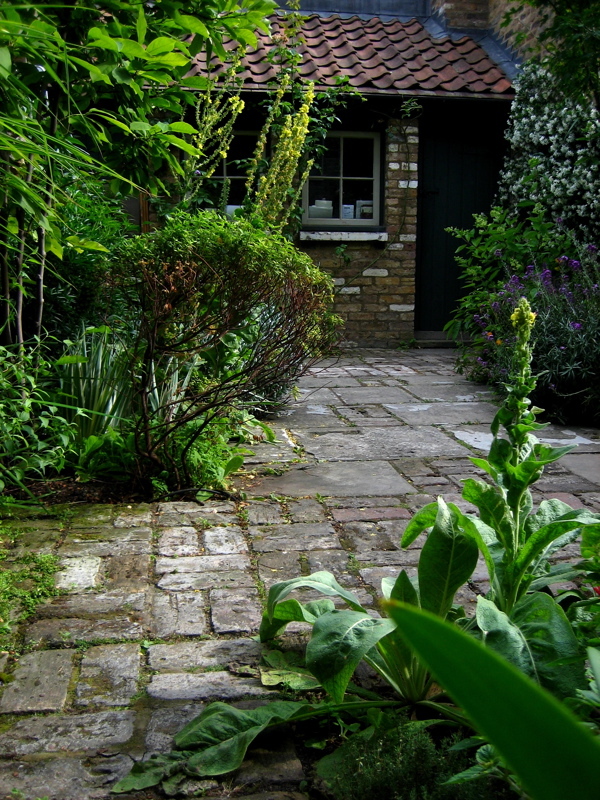 very very nice…inspires me to carry on with my own small courtyard garden. These gardens are lovely. I am inspired! Working my way slowly through the SL archive: so MANY of the write-ups just do your heart good. This one especially today. Would that my own gravel garden had half the atmosphere of these. Luis, your talent is fantastic and it looks like the garden has always been there. Saw some of these gardens this year, 2015 – little gems. Do they have open day to there gardens ? ?